Tour the largest city of Central America with a local guide to see important landmarks such as the National Palace of Culture, Metropolitan Cathedral, the Civic Center and the Bank of Guatemala. Hotel pickup and drop-off is included for your convenience with optional stay at Paseo Cayala (drop-off not included). 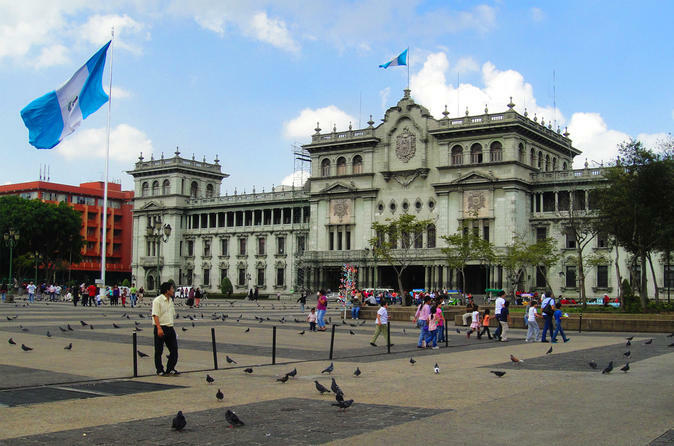 After hotel pickup, your tour of Guatemala City, formally known as La Nueva Guatemala de la Asunción, begins on Avenue of the Americas (Avenida de las Américas), named after the formation of the Organization of American States in 1948. Finish your tour enjoy a panoramic visit of Paseo Cayala and if you wish, you can stay here to enjoy a delicious dinner, if you choose afternoon option (not included). If you decide to stay, you will be able to enjoy your evening here and make by your own way back to your hotel when you were ready. If not just a panoramic view and return back to your hotel.